Equinox and solstice photo courtesy of NASA. The September equinox was yesterday. Back at the end of June, I was blessed to celebrate Rosh Chodesh (new moon) with the women of my congregation, and this past June, the start of Tammuz fell right around the time of the June solstice -- what is, in our hemisphere, the summer solstice, the longest day of the year. We celebrated with a havdalah ritual for the turn of the seasons, and it was wondrous. Ever since then, I've been meaning to create a similar ritual for the fall equinox. And I did create one! I just didn't manage to post it in advance. (Please forgive me. Life's been a bit hectic around here lately.) Enclosed with this post is a havdalah ritual which marks and sanctifies the division between summer and fall. What's the use of posting such a ritual after the equinox has passed? Well -- some sources indicate that while 9/22 is the equinox, the day when we will actually experience equal hours of daylight and darkness is Tuesday. So I think there is meaning in observing this special havdalah anytime between now and Tuesday, anytime between now and Yom Kippur. Deep thanks to Rabbi Jill Hammer, whose Tishrei wisdom at Tel Shemesh provided much of the inspiration for this havdalah! Tonight at sundown we'll enter into the new lunar month of Tamuz. In a day or two, we'll reach the solstice -- in the northern hemisphere where I live, this is the summer solstice, the longest day of the year which is also always the beginning of the days starting to shorten again. The name of this month on the Jewish calendar recalls the Sumerian deity Tamuz, who died at this season and went into the underworld. Like Tamuz, we too will experience a kind of remembered death during the season to come, as we descend into mourning for the temple which has long fallen. I've spent the past few weeks collecting teachings about the month of Tamuz in Jewish tradition (the Tammuz page at Tel Shemesh is extraordinarily helpful) and about the summer solstice in Jewish tradition (hat tip once again to Rabbi Jill Hammer; also to Rabbi T'mimah Ickovitz for her solstice teachings) and preparing a short ritual for the new moon of Tamuz which is also a ritual of havdalah, separation, between the spring now ending and the summer we're about to begin. Tonight (many of) the women of my congregation will gather in my backyard for this havdalah new moon ritual and then for some learning about this new moon and about the solstice in Jewish tradition. There are some tough things about Tamuz. In the coming month we'll remember the breaching of the walls of Jerusalem; we'll enter into the Three Weeks, the period called bein ha-meitzarim, "between the narrow straits," during which we prepare ourselves to mourn the fallen temple and the broken world at Tisha b'Av. And yet this month contains blessings, too. Rosh Chodesh Tamuz is the birthday of the patriarch Joseph. Like the Sumerian god Tamuz, Joseph descended into the earth -- not into the underworld, but into a pit, and then into Egypt. And it was because of that descent that he was able to ascend so high, and to bring his entire people with him. May our descent during this season also be for the sake of ascent! For those who are interested: here are two pages of collected teachings about Tamuz and the summer solstice, and also a two-page ritual for entering into summer / celebrating havdalah ha-tekufah, a solstice havdalah. (This is what we'll be working with at our Rosh Chodesh group tomorrow night, so if you're part of that group, you might want to skip these downloads in order to encounter the ritual and the teachings fresh. Or, you might want to download them in advance in order to spend more time with them! As you prefer.) I am deeply indebted to Rabbi Jill Hammer, from whom this ritual is adapted. Feel free to use and enjoy. Chodesh tov / a good new month to all. Getting my wings. Photo by Janice Rubin. 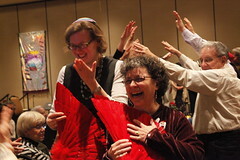 At the Ohalah conference of Jewish Renewal clergy this year I was ordained a second time, as a Mashpi'ah Ruchanit -- a Jewish Spiritual Director. This journey began three years ago, with the first winter intensive retreat of this second hashpa'ah training cohort; I wrote about that in the post Our first four days of hashpa'ah. What is hashpa'ah? The Hebrew term comes from the root which connotes shefa, divine flow; a mashpia (M) or mashpi'ah (F) strives to help people discern the presence of God in their lives. (The most common English term for this work is spiritual direction.) For me, hashpa'ah is first and foremost a relationship. In my practice of hashpa'ah, I hope to help others navigate Jewish faith and practice in a way which encourages and fosters deeper relationship with the Divine -- as my own mashpi'ah does for me. 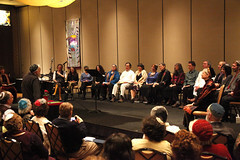 ALEPH's spiritual direction training program is unique; as far as I know it's the only one of its kind (leading both to certification and to smicha, ordination). It includes four intensive classes (learning done in-person on retreat), three semesters of teleconference coursework, four semesters of supervised hashpa'ah practice with individuals and groups, and supplemental learning in related areas. Participants trained individually and in group settings with mashpi'im (spiritual directors) who supported our spiritual growth in relationship to God and sacred service, and who modeled different forms of spiritual counseling and spiritual direction for and with us. Reb Zalman addresses the hashpa'ah musmachim. Photo by Janice Rubin. The training culminated in a beautiful ceremony. Two by two we approached the bimah and placed items of personal meaning on the bedecked table which served as our makeshift altar. There was some chant, some learning (I especially enjoyed Reb Zalman's short history of hashpa'ah, from his experiences in Chabad in 1942 all the way through the foundation of this ordination program), and some presentations by the musmachim which aimed to offer glimpses of our training and our work. ...to receive, with great laughter, pairs of beautiful bright red feathered wings. Because we learned a lot during these three years about angels in Jewish tradition, and this hashpa'ah smicha is sometimes jokingly referred-to in our community as "getting your wings." And while while we take the work of spiritual direction seriously, and we take the calling of helping others connect with the presence of God seriously, we tend not to take ourselves too seriously. The beautiful certificate of ordination, I'll frame and place in my rabbinic office; the wings, I suspect, may stay in my home office, mementos of a sweet moment at Ohalah 5772. One of the songs in my "Days of Awe" playlist (the one I listen to in the car when I want good music which puts me in an Elul/Tishrei frame of mind, not the one filled with melodies I need to practice for the Days of Awe themselves) is Bernice Lewis' "Gotta Get Better" off of her album Religion & Release. Gotta get better at letting go... She probably wasn't talking about hatarat nedarim, per se, but I thought of her song when I read the recent post on the Reb Zalman Legacy Project blog reminding us to consider doing that ritual this year before Rosh Hashanah rolls around. Hatarat nedarim means "releasing of vows." It's a ceremony in which one person assembles three others to serve as a beit din, a court of law. (Within Chabad, it's traditional to assemble ten rather than three -- and it's presumed that all are men. Within my egalitarian liberal framework, of course, gender isn't an issue.) The idea is that these friends serve as representatives of the court on high, and that if each of us can honestly say to these friends that we made vows in the last year in error and wish to be released from them, as our friends hear and accept our regrets, the heavenly court does the same. Ideally, each person gets to play both roles; each of us gets to experience being the person asking for release, and being one of the people granting it. The vows in question can't be interpersonal vows. If I promised you that I would do something, and I haven't done it, then I need to come to you and personally seek your forgiveness. Hatarat nedarim is designed for vows we've made to ourselves and to God. Maybe I promised myself that I'd start working out this year, but I didn't manage it. Maybe there's some emotional work I meant to do this year, but it hasn't happened. Maybe I dropped my davenen practice, or forgot to express gratitude. All of these intentions and resolutions are considered "vows" in Jewish tradition. The ritual of hatarat nedarim is designed to help us feel release, so we're not tying ourselves up in knots over all of the places where we've missed the mark in these personal ways. If we can do that before Rosh Hashanah, we enter the new year with a clean slate. With the new moon of Nisan comes the realization that it's time to spread the word about the Velveteen Rabbi's Haggadah for Pesach again! I'm not releasing a new version of the haggadah this year. There are still things I'd like to fix and update for version 6 (notably, now that I own Mellel, I'd like to recreate the file in Mellel so that I can actually type and edit the Hebrew from right-to-left, instead of copying it laboriously backwards! -- and I'm always finding music, poetry, and interesting interpretations to add) but even so I'm deeply happy with this haggadah, and am excited to use it again in my own two seders this year. Even more exciting, of course, is the knowledge that it will be used in so many other homes -- hopefully allowing some of what I adore in this holiday to shine in other lives. I have to tell you this was the most meaningful, thoughtful seder in memory. We went on until 2:30am, talking, sharing, thinking about liberation for the world and sharing what liberation we hope for our individual lives in the coming year... The haggadah provided a wonderful occasion for this communal introspection. Beautiful. Really. -- Lois C., France. We had a wonderful time! And we learned so much! ... [We were] nine people and one British pointer, one of whom -- the half-Chinese, half-Lithuanian whole Hawaiian Buddhist Jew -- called her father in Greece while driving here to prepare herself -- she's 30 years old and this was her FIRST seder, ever! -- Tandy S., NC. As soon as I read through it, I was impressed with your ability to meld traditional text ("with a mighty hand and outstretched arm") with more contemporary, gender-appropriate, and open-minded translation and commentary...A friend even asked to take a copy home because she so enjoyed the various psalms and other selections you included. -- Lena S., IL. As always, my endless thanks go to everyone who has helped with this project -- especially the six illustrators who donated original artwork last year. Download, read, share, enjoy -- and if you use it, or if it inspires you to create your own, let me know! Technorati tags: religion, Judaism, Passover, haggadah. There was a high hipster quotient at South by Southwest, and at first I felt drab by comparison. Where were my reclaimed thrift store garments, my multicolored hair, and my stompy boots? (Answer: I haven't thrifted in years, my hair is pretty mousy although at least the cut is cute at the moment, and I didn't pack my stompy boots because I was so excited by the novelty of going outside without heavy socks on.) But I managed to stand out in the crowd, at least a little, because I was wearing my rainbow kippah. Anyway, at South By I donned my kippah on erev Shabbat, Friday night. It was a useful way of reminding myself to be in Shabbat headspace, to encounter the world through Shabbat's especially sweet lenses. Plus, it turned out, the kippah was a great way to make me visible at the conference (the only other person I saw in a kippah all weekend was Kevin Smokler's brother, who's an Orthodox rabbi) so it was a great conversation-starter. [W]hen I started wearing it, I still wasn't much of a practicing Jew. Why was I wearing it? I felt a strong impulse, which I couldn't explain very well. I wanted to be a good Jewish role model for my kids. Maybe I wanted to show that an anti-Zionist could also be a proud Jew; or maybe to make explicit what had been understood but never spoken throughout my childhood and adult life in rural Massachusetts: that I was a Jew "from somewhere else" in a community of Christians with generations on the land. I also had this idea that I would, as the song says, "make my life a blessing" -- that I would honor God by living a moral life and by displaying honesty and compassion in my daily acts. Intriguingly, on a semi-related note, the New York department of justice just sued the state over a decision to ban wearing of the kufi, a skullcap with religious significance to some Muslims, in prison contexts. (Story here and here; hat tip islamicate.) I wonder to what extent the kufi and the kippah are related -- both the words, and the customs they represent? Technorati tags: religion, Judaism, kippah. It's never convenient, doing taharah. There's no way the call can come at a comfortable time. Maybe we knew the congregant or family member in question; maybe we didn't. One way or another, when the phone rings each of us wrestles with the question of whether and how we can make it to the funeral home by the end of the workday. We have jobs, families, obligations that need to be juggled. When we arrive after work, we're all a little bit harried. It's inevitable. But as we read psalms, gathered in the bland funeral home livingroom, the stresses of the day start to fall away. Slowly, without realizing it, we move into a different headspace. When we wash our hands, when we glove up, when we talk to the meit and ask her forgiveness for any inadvertant error we might commit during the process of taharah. When we caress her with washcloths, when we pour our portable mikvah in a continual stream, when we declare her tehorah, pure, and mean it. Afterwards we stand outside the funeral home, blinking in the dazzling late-evening light of high summer, and talk quietly, reluctant to break what we've woven together. We say things like, "Maybe it sounds strange, but I really felt God in that room." We say, "I can't put it into words." We say, "The whole day is different now." And we smile, and thank each other, and hug each other, and drive away changed. For a short while, everything is transformed by the extended meeting with the ineffable that arises in the work of taharah. There is nothing like it. We are so blessed. Technorati tags: religion, Judaism, taharah. Brad opened the door of the Excursion and showed me a cardboard box filled with beautiful carved pieces of wood. As I moved my hands through the pile, they made music, like wooden xylophone keys. "This one is purpleheart," my brother told me. "This one's rosewood." The wood colors ranged from pale yellow to a dark stripey brown that was almost black. Red and golden, ash and oak and mahogany. None are stained -- only varnished with a clear coat to protect and showcase the natural colors of each kind of wood. On the final night of this trip to San Antonio, my whole family went out for Mexican food at El Jarro del Arturo. The guacamole was great; the ceviche, even more so; the chance to clink glasses and talk with my family, better still. But best of all was standing in the muggy late evening under the parking lot klieg lights, choosing a yad made by my brother's own hands. It felt a little bit like choosing a magic wand; I couldn't resist asking whether any of them had phoenix-feather cores. (The answer was, alas, no.) Once I had made my choice, I showed it off to my nieces who I know are Harry Potter fans. "Swish and flick," I said, giving it an experimental slice through the air, and the girls giggled and suggested I try "wingardium leviosa." It was hard to pick just one. They're glorious. In the end I went with one of his two-handed yadayim -- instead of having one pointer end and one end with a finial and a silver chain, this one has a pointer at each end, one right-handed and one left-handed. I've never seen another like it. "Good choice," my brother said. "That's one of my favorites, too." The two hands, he noted, can symbolize a kind of yin and yang, which makes me like it even more; I love the idea of reading Torah with a pointer that symbolizes the bridging of opposites. Earth and heaven, sacred and profane, the written text and the truth that flows through and beyond it: my little two-handed yad hints at all of these. And, I think, at the way no one does anything of import single-handedly or alone. 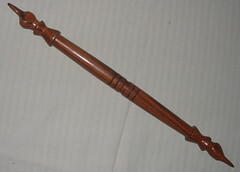 Next time I read from Torah, I will bring my beautiful rosewood two-handed yad -- a Brad Barenblat original -- and I like to think it will bring even greater-than-usual sanctity to my engagement with the words, and greater joy. I don't mean "ordinary time" in the Christian sense, naturally. Though I suppose if its deep meaning is "measured or numbered time," today counts...and it's certainly a strange kind of ordinary, in the absence of what had made Mondays extraordinary for so long. Today is the first Monday after the end of my extended unit of CPE. It felt strange not to begin the morning by driving the curving roads to Albany, not to ask my colleagues how their Sunday sermons had gone, not to settle in for a day of school. Charles, bless his heart, reminded me in a comment yesterday that I had promised to do something special today, something meaningful or restorative or just-for-me, to keep from feeling glum on account of not being with my fellow chaplains all day. So this morning I drove down to the beautiful spa at Cranwell; I have a gift certificate there which I've been slowly using up, and today I tried my first Pilates class. I like it. Not as well as I like yoga, but there are some similarities. Mostly it felt good to make time for exercise, which I'm not good about doing. (Someday I'm going to blog about the list of disciplines I wish were actually everyday occurrences in my life -- writing, prayer, and physical activity chief among them. Exercise for my mind, spirit, and body.) After class, I spent a little while in the womens' spa, which is free with class participation. Ten a.m. on a Monday is not a busy time there; I had the place almost to myself! I sampled the steam room, and the sauna, and spent a little while lolling in the beautiful tiled hot tub. It felt like a kind of mini-mikvah, despite the lack of a witness or of living waters. I made a bracha and dunked four times, once for each of the four worlds, holding in my heart some of the actions, emotions, thoughts, and essence of the CPE program I've just completed. It was a sweet kind of closure. And then I took a nice cool shower, and drove home listening to good music, and opened up the Torah to this week's portion, and got to work. Technorati tags: religion, Judaism, pastoralcare. This week I had the opportunity to engage in a new mitzvah: shmira, sitting with the body of someone who has died, keeping watch. In the traditional Jewish understanding the soul remains near the body until interment. In order for that soul not to feel abandoned, we arrange for people to sit with the body. I took the 2:30-5:30am shift last night. On Wednesday I had gathered with six other members of the chevra kadisha to do taharah, the ritual cleansing, blessing, and dressing of the body. This was only my second time doing this work (I wrote a long essay about my first experience, just over a year ago) and it was both like and unlike the first. This time I knew the woman who had died, which made it harder in some ways; this time I had nine months of hospital work under my belt, which made it easier. I am far from a night owl, as those who know me well can attest. The hours before dawn are not my finest ones. So I spent part of the night reading a novel (my friend Naomi Novik's second book, which is easily as marvelous as her first). Since the man who was shomer during the shift before mine told me that the widower had left word that he wouldn't mind if we napped, I imagine he won't mind that I read a little fiction during the wee hours to keep myself alert. I talked a little bit to the woman whose soul I was accompanying. I thanked her again for her kindness to me during the years I've been a part of Congregation Beth Israel, and assured her that she is well-loved and will be missed, which I think she knew even as she made the decision to eschew heroic measures in the hospital on Monday. The atmosphere in the room was sweet and peaceful, though a little bit charged. My replacement ran late, so I sat a while in meditation. My thoughts turned to the realization that someone, I don't know who, did this for my grandparents (of blessed memory.) I know that one of my cousins serves on the chevra at his synagogue in Dallas, which means he has done this, too. There's a deep comfort in knowing that so many others have done this, as I do it now, and that someday someone will do it for me. Not because it makes sense, but because it has meaning. There's more I'd like to say about that, but words aren't coming as smoothly as they might. (I'll blame that on the sleep debt.) What matters is, this feels important to me, and I'm glad I did it. I drove home at seven as the glorious light of early sun gilded the newly-greening trees and hills. The words of the morning blessing for gratitude rang even clearer than usual in the face of how I had spent my night. I am grateful to You, Eternal; you have returned my soul to me this morning; great is your faithfulness! 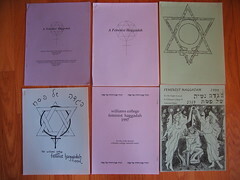 In preparation for the talk I'm giving at my alma mater on Sunday, I dug through my files and unearthed six versions of the Willliams College Feminist Haggadah. Just holding them in my hands is like travelling through time. I was invited to join the feminist seder committee in the winter of my freshman year. The first feminist seder had been held at Williams in 1992, the year before I arrived, using a haggadah created by Marissa Brett, Joellen Krupp, and Holly Lowy; I worked with Rachel Clark, Dara Eizenmann, Lauren Golden, Holly Lowy, and Marianna Vaidman to revise it for year two. We gathered in a tiny dorm room, leaving our snow- and salt-crusted shoes in the hallway, and had passionate discussions about candle-lighting and hand-washing and blessings for weeks on end. At last we declared our revisions complete. We took the haggadah to Office Services to be copied and stapled. We scurried around the JRC's kitchen, making tray after tray of potato kugel and shaping a endless number of matzah balls. When the seder rolled around, I remember a few people giving me a hard time -- one woman in particular seemed offended that we wanted to mix the chocolate of our feminism with the peanut butter of her Judaism! But on the whole people seemed moved, or at least intrigued, and the tradition took hold. These memories -- the talking, the cooking, the ritual -- have limited resonance for those who weren't there. But the pile of bound documents on my desk tells a story that might be more universal. The evolution of our small Jewish feminist community parallels the larger evolution of Jewish feminism, I think. These haggadot are like snapshots of where we were, each year at Pesach-time as our Jewishness, our feminism, and our liturgical sophistication grew. "If we wait until we feel truly ready, we may never act at all." Those words appear in my haggadah for Pesach, in the paragraph preceding the blessing and eating of matzah. Every year they give me a happy little shiver. They're a useful call to action, a safeguard against letting the perfect be the enemy of the good. This year, they're nudging me into releasing my haggadah today. Passover is my favorite holiday, bar none, and the process of creating my own haggadah is a large part of the reason why. Good liturgy is like good poetry; it requires good words and good intent, and when it works it's more than the sum of its parts. And there's no story like the Passover story: rich, powerful, endlesssly resonant. I love working on my haggadah, and then I love leading a seder with it, the words I've collected and crafted coming to life in the mouths of my friends and family. "It is a beautiful haggadah. Worth reading and studying and using," said Rick of Jewish Current Issues. My friend Lorelei reported, "it's the first time I've ever heard anyone ask, 'When do we get to read more? After we eat?'" And my friend Sandy of Number Five Looks Just Like You said the haggadah is "incredibly well-honed and interesting and real." My endless thanks go to everyone who's helped with this project, especially the six illustrators who donated original artwork to this year's edition. Download, read, enjoy, share it far and wide. And if you have reactions, responses, questions -- if you use the haggadah, or if it inspires you to create your own -- let me know! It's been two years since I last released a version of the Velveteen Rabbi's Haggadah for Pesach; this year a new edition will arrive on the scene, definitely by the end of the month and hopefully sooner. I'm really excited about it. Some of the revisions and additions -- readings, prayers, poems, and songs -- were inspired by my experience last spring celebrating Pesach at Elat Chayyim; some have been accumulating in my "add to haggadah" folder over the last couple of years; and some are brand-new, created just for this haggadah. Beth Budwig is a visual artist who works in a variety of media, and also does web design; a few years ago she did a large-scale commissioned painting for Inkberry, the arts nonprofit I co-founded. Emily Cooper is a science illustrator with a light hand, an eye for detail, and a delightful sense of whimsy. Read about her here. Howard Cruse is a comix artist and graphic novelist, best known for Stuck Rubber Baby, whose unmistakeable style works equally well for serious subjects and for comic hijinks. Read about him here -- or check out his blog, where he recently made a fascinating post showing how he created the illustration he made for the haggadah. Allan Hollander and Alison Kent often post their illustrations to their joint blog, Feathers of Hope. Yaron Livay is an Israeli-born printmaker whose prints exemplify the dialectical tension between solidity and joyfulness that Judaism holds so dear. Read about him here. I'm at a loss to express my gratitude to these wonderful people for their kind and generous donation of artwork for this haggadah. If you download the haggadah and you like what you see, please tell them so; and please browse their sites, spread the word, and buy their work! Without my tallit, I'm more easily distracted in prayer. And if the little sounds and sights of my shul can tug my attention away from the Holy Blessed One, how much more so might the bellowing of yearlings or the thick odor of incense have distracted Aaron? Wearing something special, a consecrated garment or family heirloom tallit, doesn't guarantee perfect kavvanah (focus/mindfulness) -- but it's a good step in that direction. We're human; we're flawed; we forget. Aaron's fancy vestments, so lovingly described in this week's portion, reminded him of what mattered -- just as our tallesim remind us, today. Read the whole thing here: Holy garments. This isn't just academic. We're a smalltown shul with a small membership, and we often have to invoke this rule. Other times we have to eschew taking the scroll out of the ark altogether. We still read and study Torah together, of course; we just do it from our books, instead. Though I try not to let low numbers impact the Torah discussion -- I owe it to whoever's there to offer them as thoughtful and energetic a study session as I can -- I do feel something's missing when we're not able to savor the pageantry of taking our Torah out of the ark. David likes to ask me hard questions. So he asked, with a twinkle in his eye, why we're still attached to the number ten. We're happy to break with Orthodoxy in order to count women as well as men, so why aren't we willing to break with custom on the question of how many people are required? (After all, it is related in the Babylonian Talmud -- in Soferim 10:7 -- that in Palestine, as few as six men were once counted as sufficient to say communal prayers.) If there's precedent for fewer, why not make use of that precedent? And if there's precedent for changing on the gender front, why not change on the number front? Happy (belated) New Year, trees! "Today is the full moon of Shvat -- well, it's not long after the full moon," I amended. "It's the full moon, observed." Everyone laughed. "Which makes it Tu BiShvat: the new year of the trees." My synagogue's Tu BiShvat event was meant to happen last weekend, but we postponed it by a week because of the dire weather predictions. As it turned out, we hardly got any snow here last weekend -- I envied those south and east of us! -- but by the time we realized it was safe to be on the roads, we had already set up the phone tree to inform people of the new date. So, our Tu BiShvat event was today, and we gathered several families with young kids for a morning of activities followed by a potluck lunch. We began by passing out apples slices and talking about apples: why we like them, why they're special, what it's like to pick them. We brainstormed the many steps in the trip these apples took from their tree to our fingers, and took a moment to be thankful for the apples, the trees, and everyone who made the apples' journey possible. Then, of course, we blessed and ate them. Mmm. 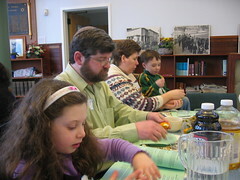 Then, my favorite part: the seder! We used the haggadah I posted here earlier this month. I edited a little on the fly, since our crowd was mostly smallish kids and parents (and some of the readings in there are a little heady), but I thought it went smoothly. As always, we took our mystical journey through the four worlds, drinking juices to match each world (and each season), and eating different fruits to match the first three worlds (the fourth world, essence, can't be adequately represented). Home now, relaxing in the wake of a holiday well-celebrated, I find myself gazing out the window at the hillside behind our house, thick with the trunks and branches of bare winter trees. It's nice to think that no matter when each first sprouted, this full moon marks a new year for them, the time when -- according to tradition -- the sap starts to rise again, feeding the new year's growth. As it turns out, one of my favorite seasonal markers coincided with Tu BiShvat this year: Ioka Valley Farm, the sugar shack nearest to our house, started to offer maple breakfasts again, as they do each year during sugaring season. I doubt they had any idea last weekend was the Jewish New Year of the Trees, but the synchronicity of it makes me smile. Today may be cold and windy, but in some deep way we've turned a corner toward the eventual coming of spring. Technorati tags: religion, Judaism, TuBiShvat. Mainstream Jewish tradition follows Hillel in most things, so we mark the new year of trees at the full moon in the middle of the month. 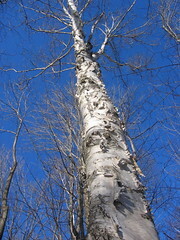 Out of the notion that trees have their own new year (originally used to mark the age of trees, to determine when one should begin tithing fruits to God and when one could eat of the fruits oneself) came an elaborate set of holiday traditions, up to and including a mystical journey through the four worlds. I love this about Jewish tradition -- we're forever expanding small texts in new ways. I'll be celebrating at my synagogue, where we'll begin the day with a trio of environmentalism workshops for kids of various ages, and then proceed to a Tu BiShvat seder and potluck lunch. (If you live locally, you're invited; it's open to all, kids' program at 10am and seder at 11:30.) 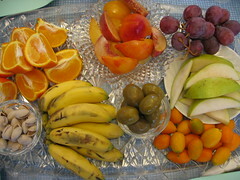 The custom of the TuBiShvat seder comes from the medieval kabbalists of Tzfat, who connected each of the four worlds with a season and symbolized each with a different combination of juices and fruits. Of course, our haggadah diverges a little bit from theirs. Call it a modern variation, based in tradition but not bound to it. I think our changes and additions are good ones. I hope you'll agree. Enjoy the haggadah. Feel free to use it, or to modify it, or to be inspired by it to create a haggadah of your own. (And if you do use it, let me know what you think, and how it works out for you -- I'm always happy to get feedback.) May Tu BiShvat be joyful for you and yours! Tu BiShvat, the New Year of the Trees, is coming up, so I've had the pleasure of spending the morning revising the haggadah that we will use at my synagogue's Tu BiShvat Seder. I'll post a copy of the haggadah once I'm finished tinkering with it. Until then, if you're planning an observance of your own, here are a few nifty resources I've found. Over at The Coalition On the Environment and Jewish Life, there are two different sets of four questions for the Tu BiShvat seder. (The four question conceit is meant to parallel the familiar four questions from the Passover seder.) We'll be adapting both of these in our haggadah, because I think they're both neat: Ellen Bernstein's Four Questions for Tu BiShvat and Rabbi Larry Troster's Four Questions for TuBiShvat. I like the simplicity of hers, and the way they match the Passover questions in tone. And I like his provocative questions, like "What do I know about the place where I live?" The "one-sided" haggadah may be a better bet if you're not already deeply immersed in the esoterica of the holiday. (Despite its name, is actually designed to be printed on two sides of a single sheet of paper, which is then meant to be folded, to suggest a booklet.) I like the way its interior is divided into quadrants, each with a kavvanah, an instruction, and an action one can take.